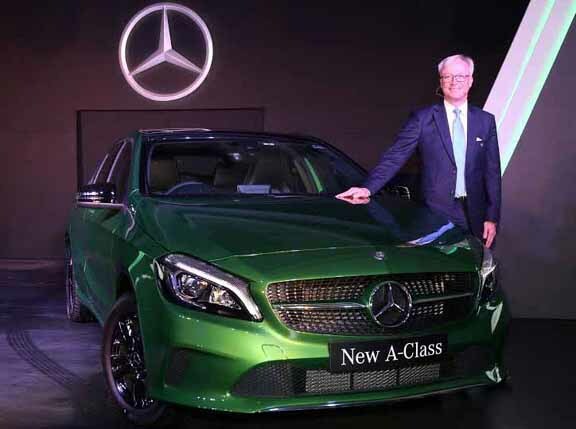 Mumbai : India’s largest luxury car maker Mercedes-Benz today drove in the all new A-Class, redefining the ‘compact luxury’ segment which it pioneered in India. The new A-Class carries Mercedes-Benz’s famed design philosophy of sensuous clarity and exudes modern luxury. It sets new benchmark in the compact luxury segment with enhanced comfort, sportiness, safety and efficiency levels. The new A-Class which marks Mercedes-Benz’s fulfilling the commitment of launching 15 new products in 2015, was launched by Roland Folger, Managing Director & CEO, Mercedes-Benz India in Mumbai, today. Roland Folger, Managing Director & CEO, Mercedes-Benz India commented, “We couldn’t have concluded the product offensive of 2015 with a better product. As the most progressive model in the compact luxury segment, the A-Class has been instrumental in making Mercedes-Benz brand more youthful." "The A-Class pioneered ‘compact luxury’ in India and with the new A-Class we have just raised the benchmark even higher. We are confident that the new A-Class will continue to remain on top of customers’ preference as it offers an unmatched package comprising dynamic sporty design, high grade selections of equipment, class leading performance, world-class infotainment system and uncompromised safety features. We made the A-Class even more appealing and ready for our dynamic new generation customers,” he said. Roland Folger further added, “With the launch of the new A-Class, we reiterate our promise of bringing the most fascinating cars from our global portfolio for our valued customers in India. The product offensive of Mercedes-Benz in 2015 with the ’15 in 15’ approach has been highly successful and is bearing fruit, as is visible with our sustained growth momentum." "We are confident that the addition of the new A-Class will further strengthen our New Generation Cars portfolio and will continue our conquest of new customer base,” he said.